The holidays are quickly approaching and to me it always feels like after Halloween everyone skips straight to Christmas. 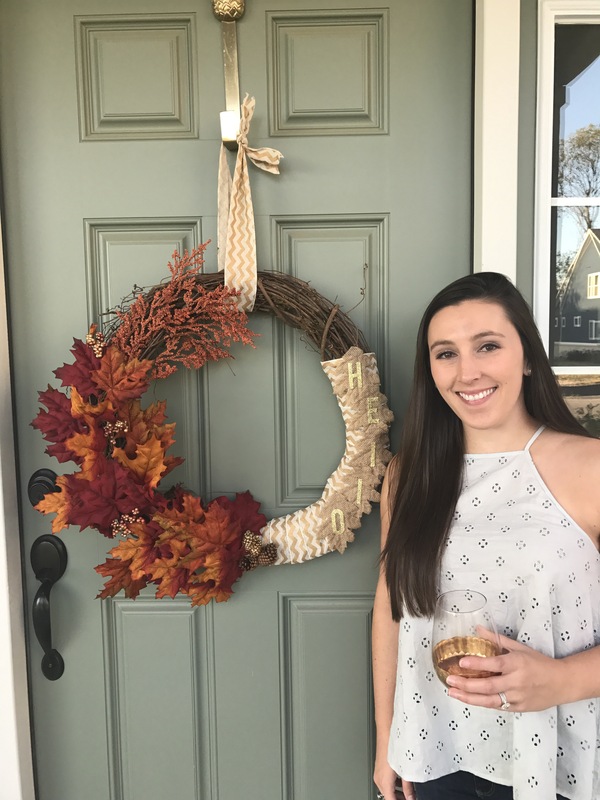 My favorite holiday is Thanksgiving and I do not start celebrating or decorating for Christmas until Thanksgiving has passed. 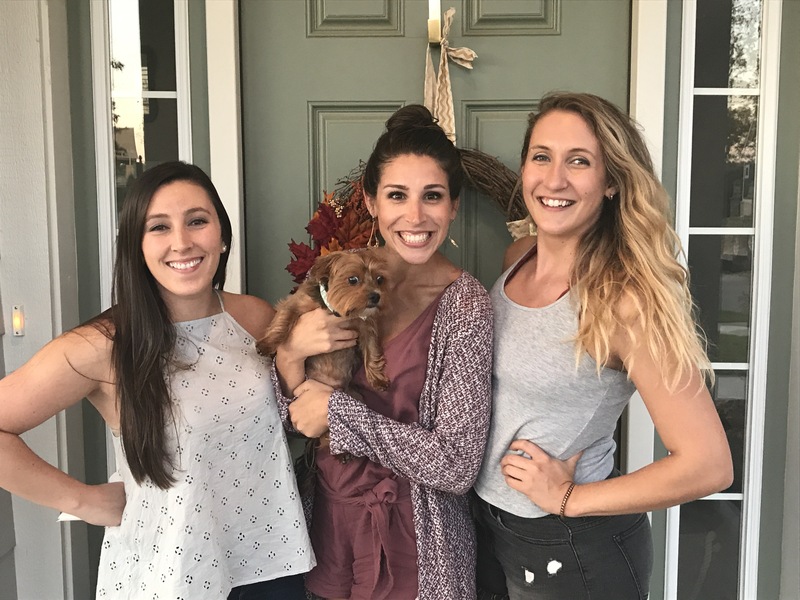 I have always loved Thanksgiving as it is a time to not only enjoy wonderful food, but a time to look around and be truly thankful for the blessings and people in my life. As I have gotten older and moved around I have come to love my friends as family and count them as a blessing. 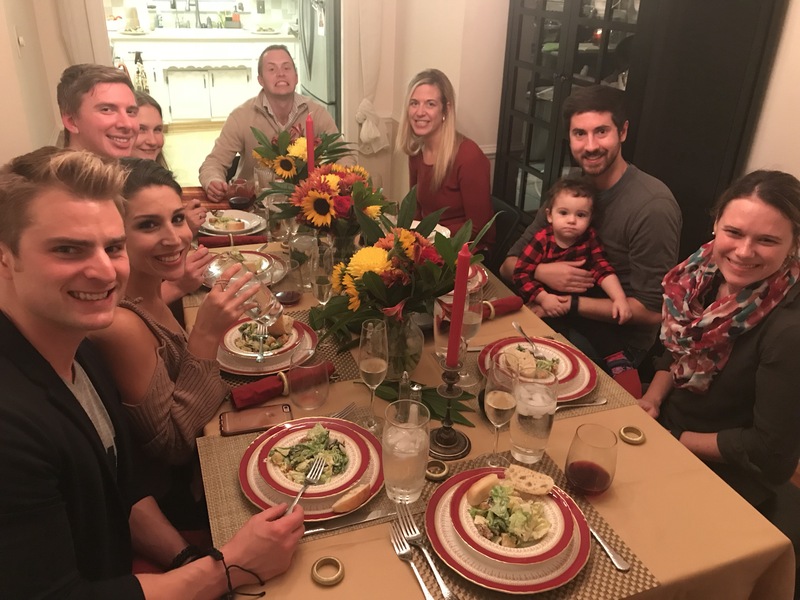 For the past 3 years I have hosted a Friendsgiving and though some of the faces around the table have changed the gratitude I have remains the same. I begin by planning my tablescape. I always do a formal china setting with the cranberry and gold china with cloth napkins to match. 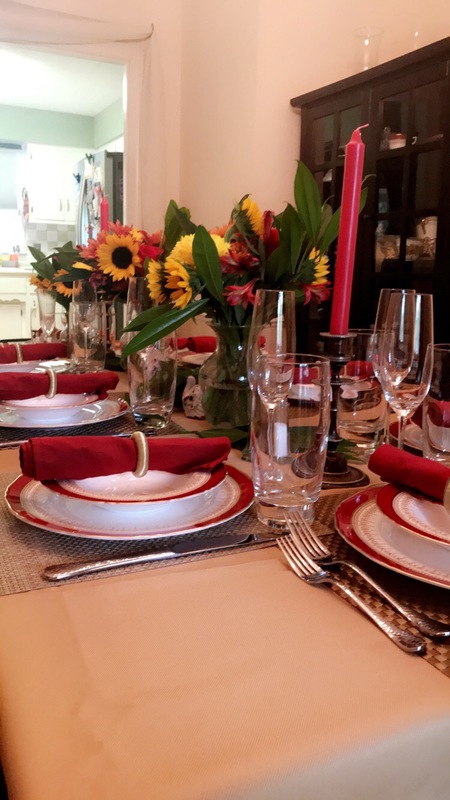 The napkins, napkin rings, placemats and tablecloths come from TJ Maxx. Each year my centerpieces vary from fresh cuts or pumpkins and gourds. This year I went with candles and fresh flowers from Trader Joe’s as they always have the best floral selection. Each year I provide the main course and appetizers while my guest each provide a side item or dessert. I give assignments for type of items to bring as I know I want a salad, vegetable, dessert, bread and drinks to arrive. 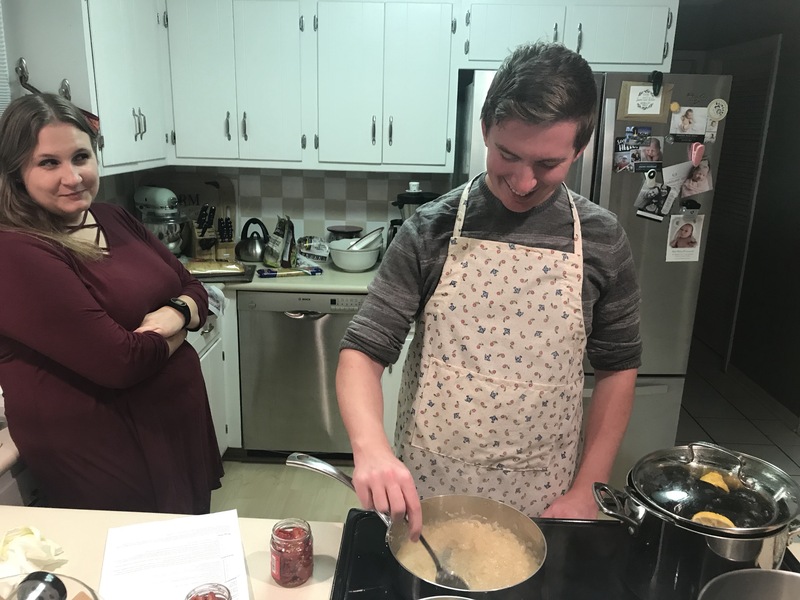 In hosting and asking people to bring a dish if you do not provide more specific direction you could end up with 5 desserts versus the variety you want! Appetizer table included Oyster Rockefeller , charcuterie board with supplies from Trader Joe’s, and apple brie bits. If you are looking for great seafood around Indianapolis I recommend Caplinger’s as that is where I purchase my seafood. Charcuterie included crackers, salami, herbed goat cheese, 3 pack of cheese from Trader Joe’s (can’t remember the types), olives, pickles, jam, honey, peanuts, cashews and chocolate covered expresso beans. 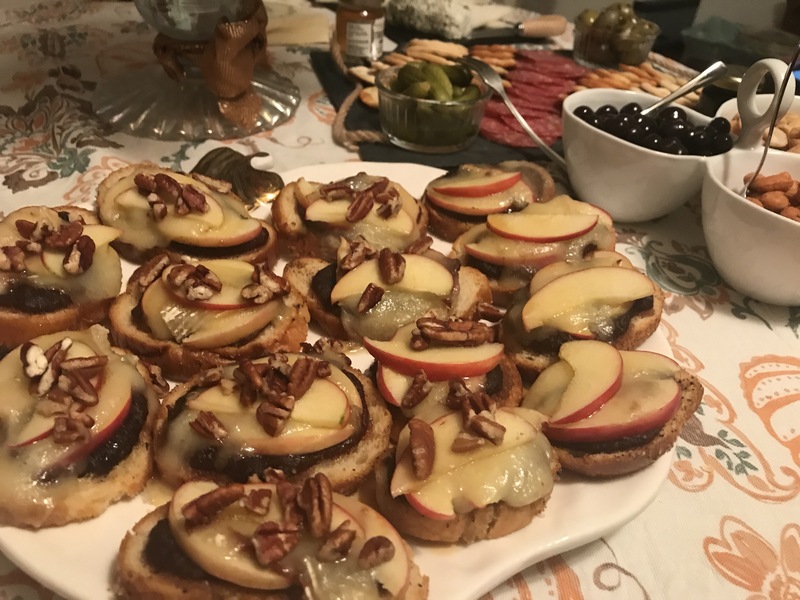 Apple and Brie bites- Crostini from Fresh Thyme with apple butter spread on top then add thinly sliced apples and cubes of brie and bake until brie melts. Then add another thinly sliced apple on top with crushed pecans and drizzle honey over, then serve. 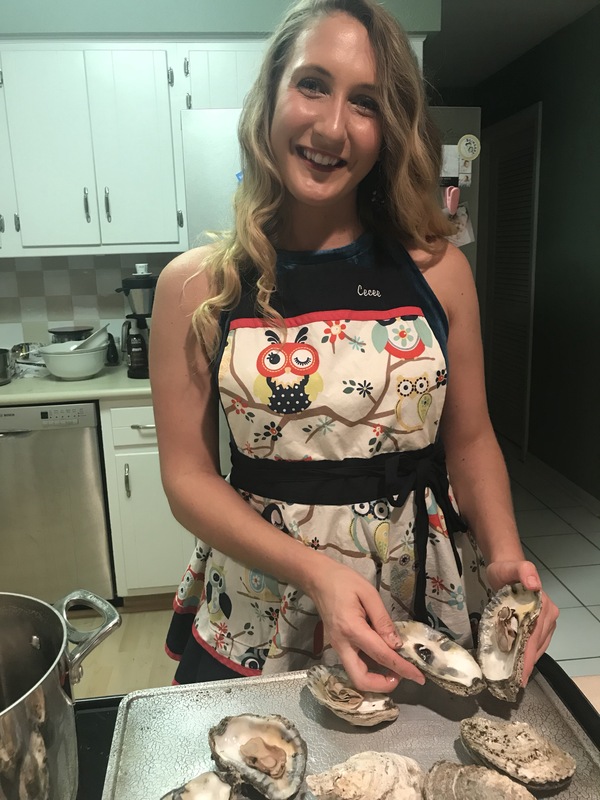 For the main course my assistants, Christy and Jordan helped me make lasagna, tuscan shrimp, pasta and mussels in a white wine garlic sauce. Sharing a meal and laughs with people I love brings so much joy to me. I am beyond grateful for the many friendships that I have. Not all of those friendships were around the table this year, but the love and support I feel from my friends mean more than I could ever express. 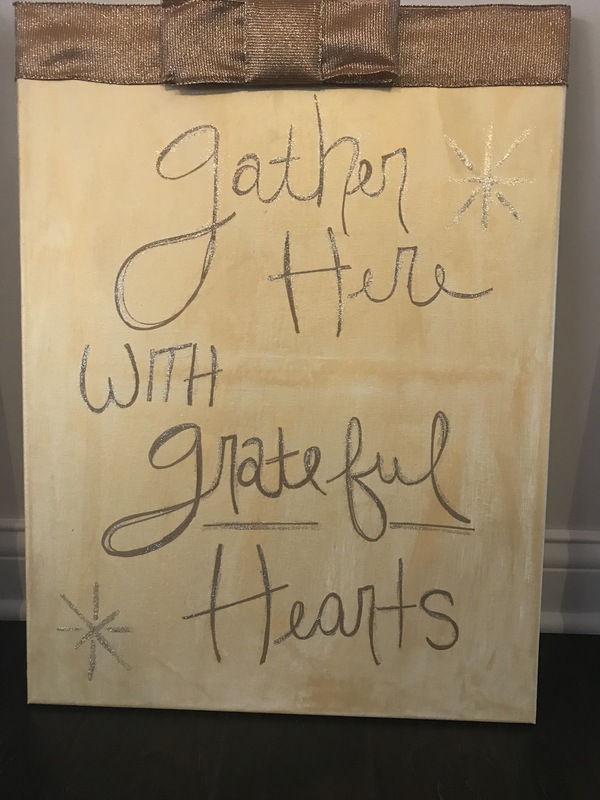 Enjoy the holiday season, count your blessings and gather with a grateful heart! This weekend was so much fun! 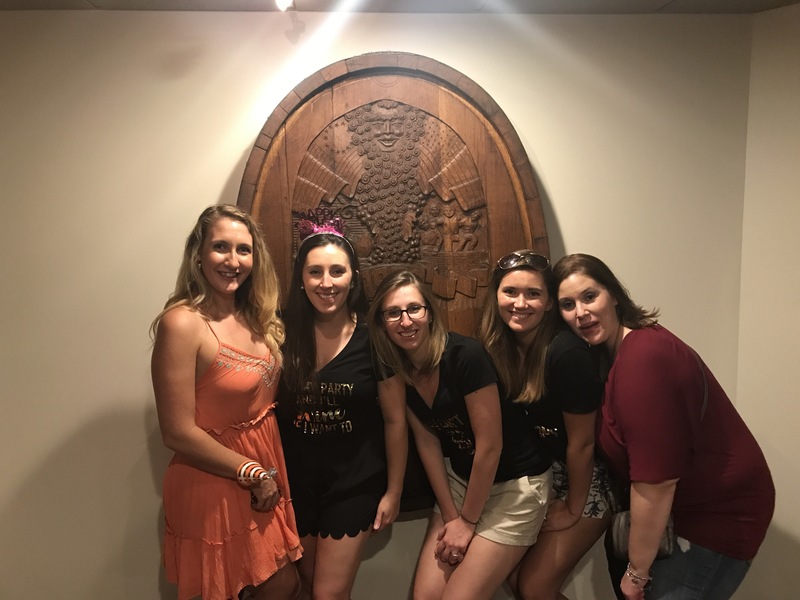 My lovely, spunky and oh so fun bestie celebrated her Dirty 30 the only way we know how… with wine and so many laughs! Ebeth has the best husband, amazing family and a wonderful friend group, if I do say so myself. That being said how could you not have the best time when you are with the best people! 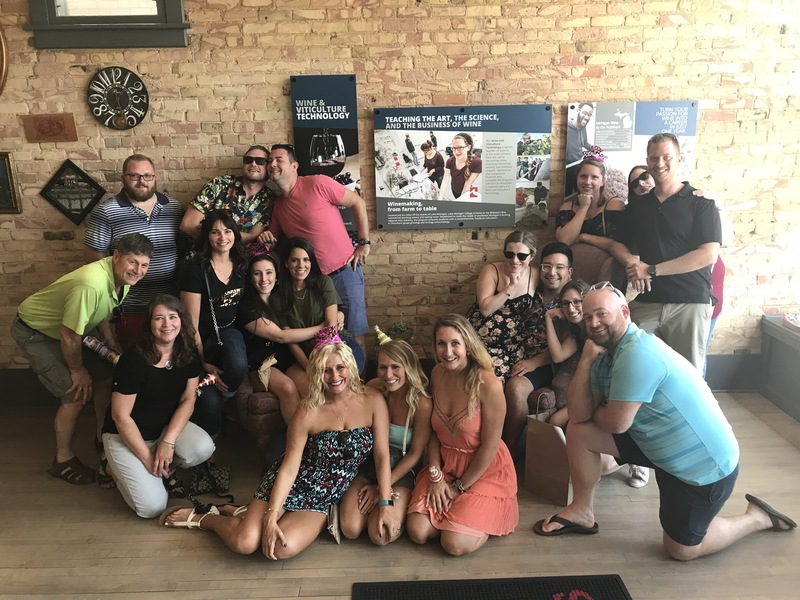 Ben (Ebeth’s hubs) did a great job organizing a Michigan wine tour for 19. 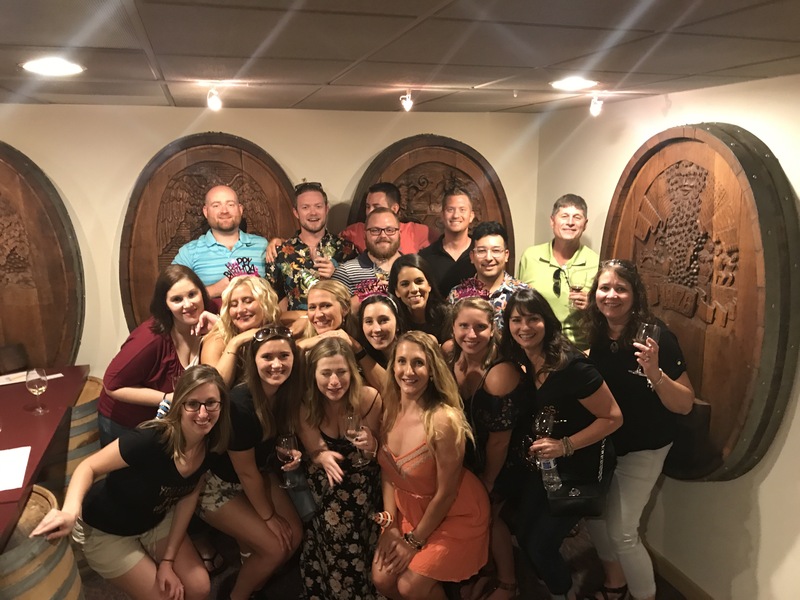 Out of the 19 of us on the wine tour 17 of us had a massive slumber party at our friend, Doug’s home. I’m impressed by the gracious hosting and planning these two guys did! Feeding and housing that many people for a full weekend with activities is hard work and the guys more than exceeded! Friday was a travel day with friends and family traveling from MO, IL, WI and IN. We enjoyed pizza, catching up and watching all the pups interact that night as Saturday morning would come so soon! 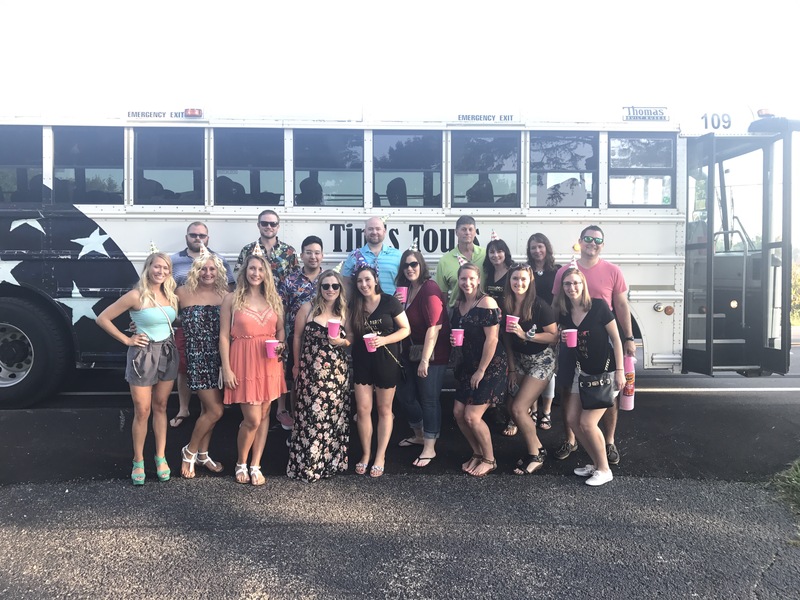 Saturday morning began with mimosas and coffee around 7:00 as 17 people needed bathroom time before the bus arrived at 9. Poor Doug will probably be finding strands of hair from the dozen of us girls getting ready all throughout the house for the next year haha! The cooler was packed with beers, mimosas, sandwich items and other snacks for the day as we all geared up with Birthday garb to head out! 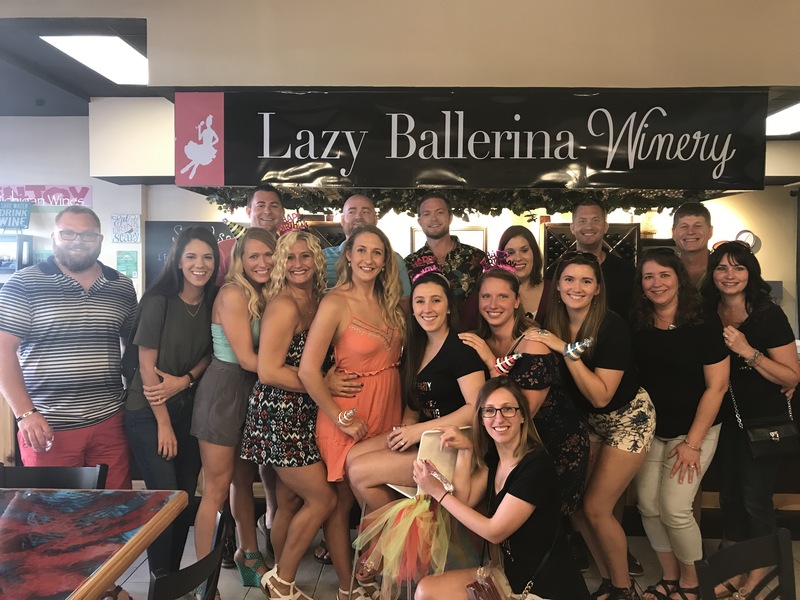 Our first stop was the Lazy Ballerina in St. Joe, which was the cutest town. I want to go back and explore more as just the quick glimpse caught my eye! 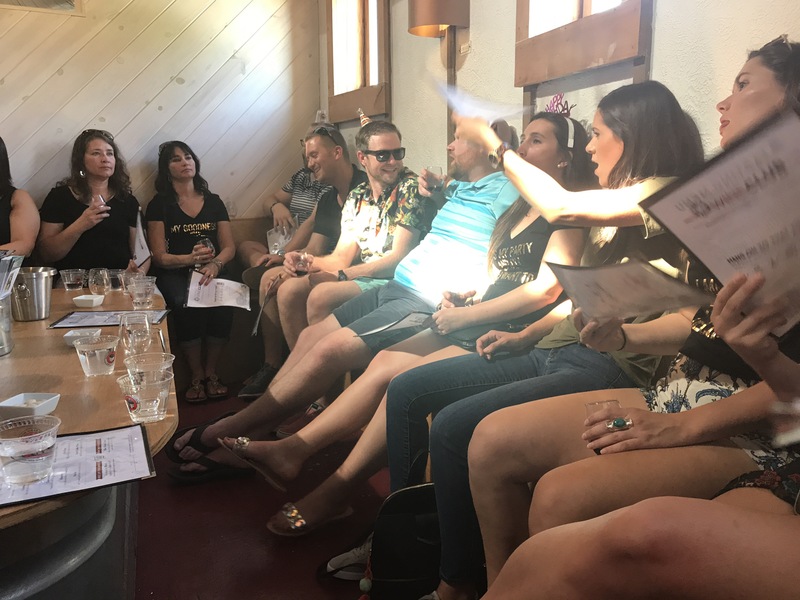 Quick tip if you are with a large group and you get to keep your tasting glass be sure to ask for a box with dividers to put the glasses in. As you can guess from looking at this group a broken glass (or 3) is waiting to happen. Of course it did times 3, but not on the bus with our tasting glasses! 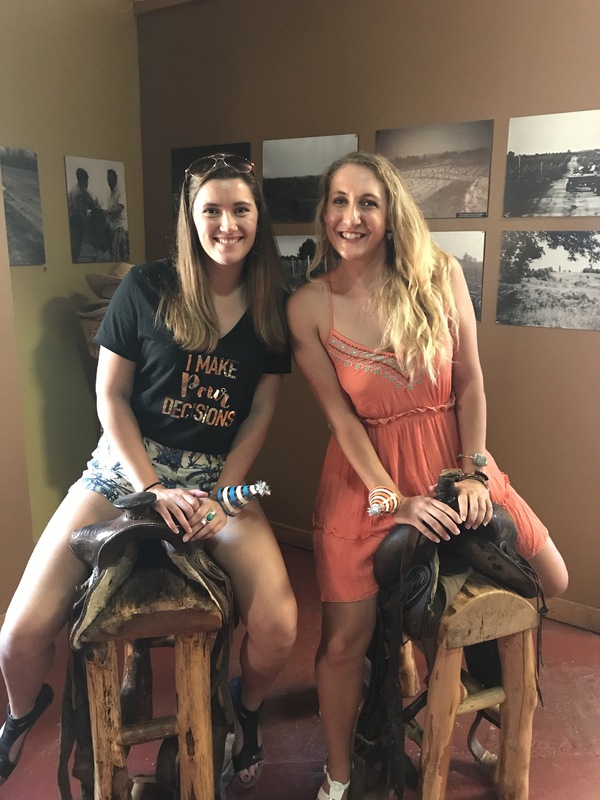 Our next stop was to Baroda Family … Groupon for the win on tasting savings oh and who doesn’t love hoping on a saddle!? Next we ran across the street to Lake Michigan Vintners, which is where the first glass went down. I skipped this tasting and opted for a glass of wine instead. Then we hoped on the bus to head to Tabor Hill, which was gorgeous! 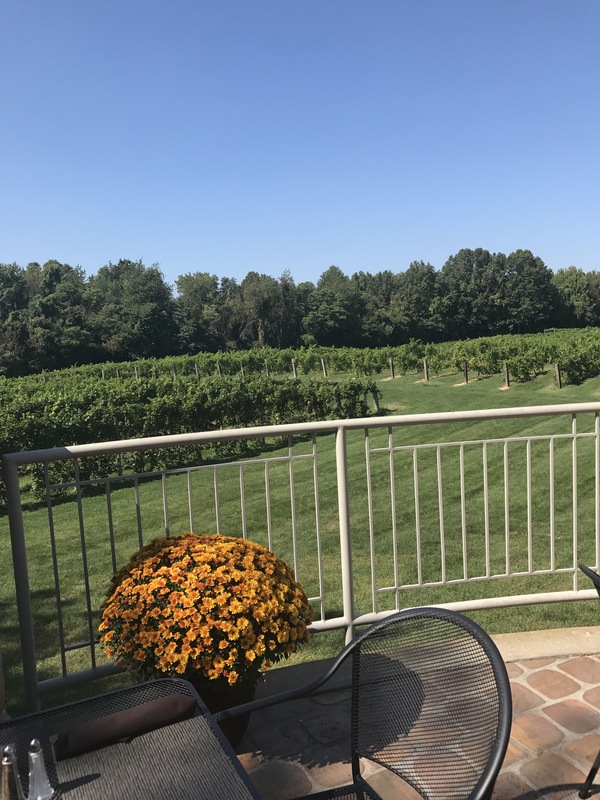 I would love to go back and enjoy dinner on the patio there at some point as below is the view on the patio. 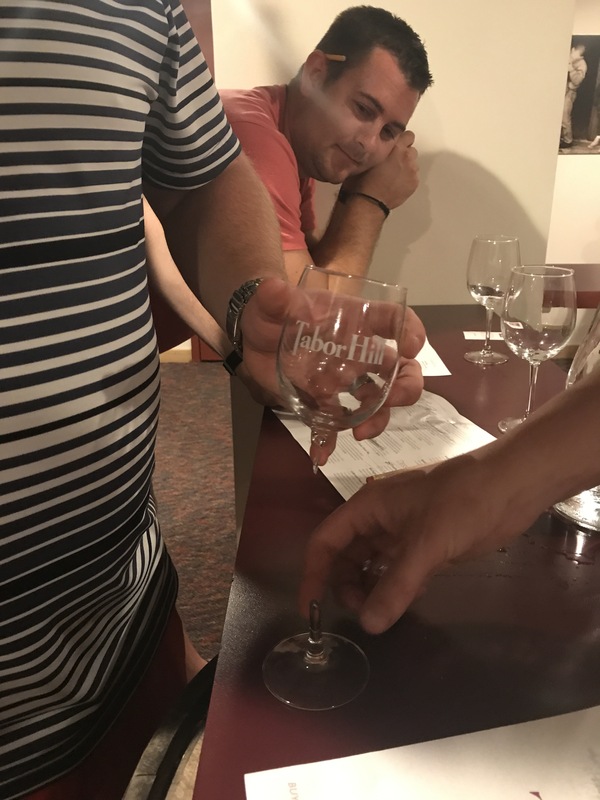 We had a private tasting room set up for us downstairs, which is sadly where 2 more wine glasses met the trash. 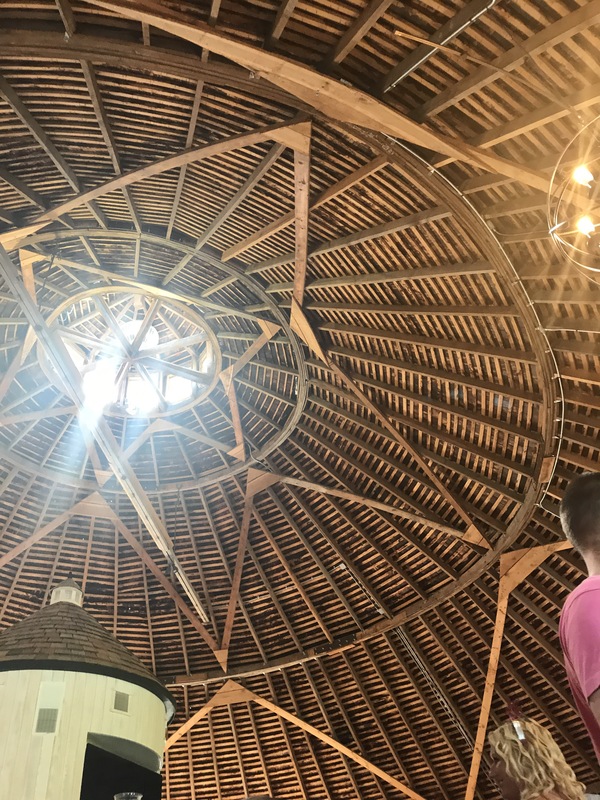 We then continued to our final winery in the 90 degree heat that was not air conditioned 😳 equating to hot AF in a big barn! 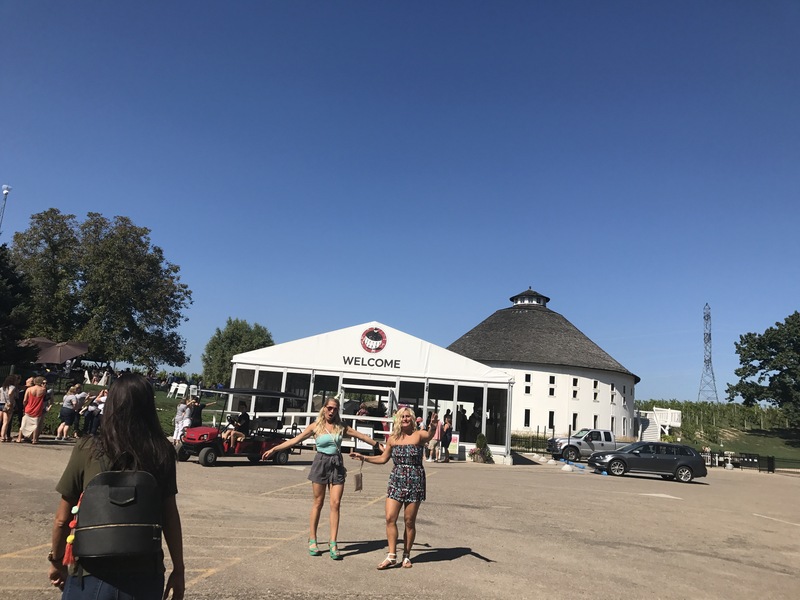 On a cooler day and not being a final stop I think I would have enjoyed Round Barn winery more as the structure was beautiful. 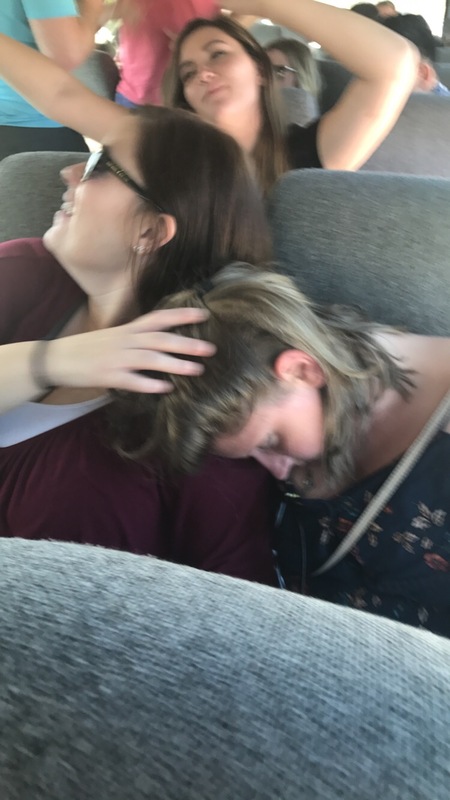 We then enjoyed our bus ride back to IN with some fun jams while the true champs napped through our terrible singing while the music blasted! We then grilled out. As you can imagine after all this fun that items ended up a little charred, but it all pretty much was consumed ! 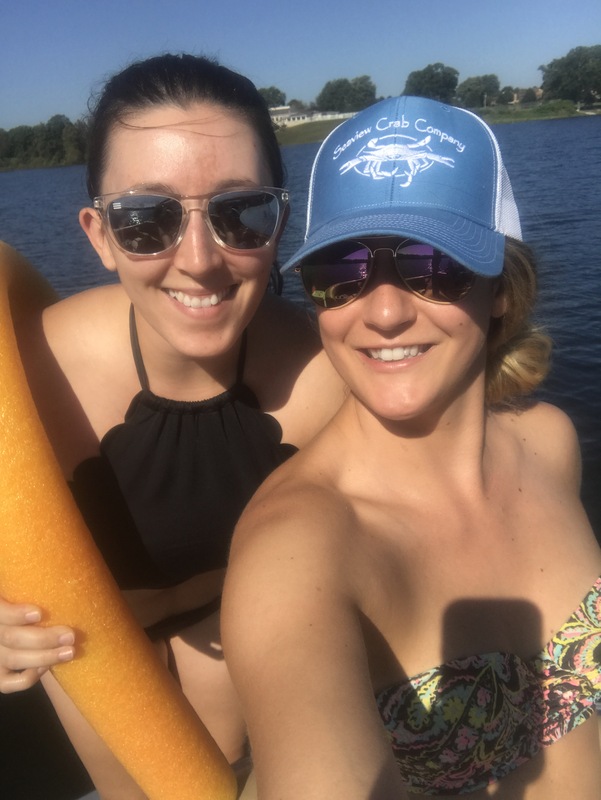 We continued the fun with some sun on the lake today before our journey home! 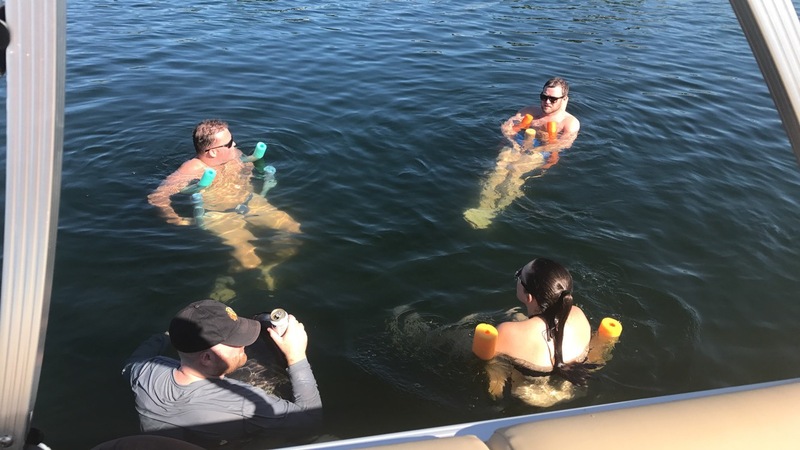 Big thanks to Doug for opening his home and taking us out on the lake! Big thanks to this cute couple for including me in the fun and for Ben organizing the fun! 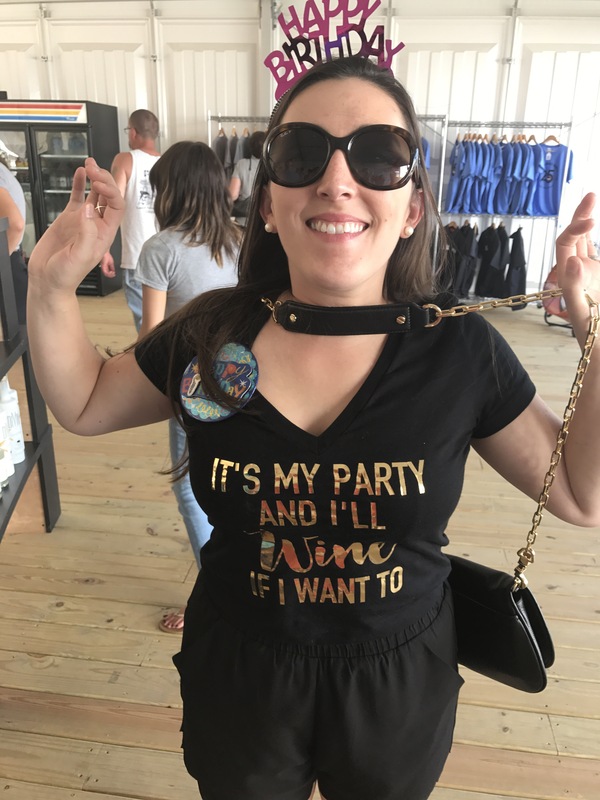 The happiest of birthday wishes and all the love to this gorgeous gal! 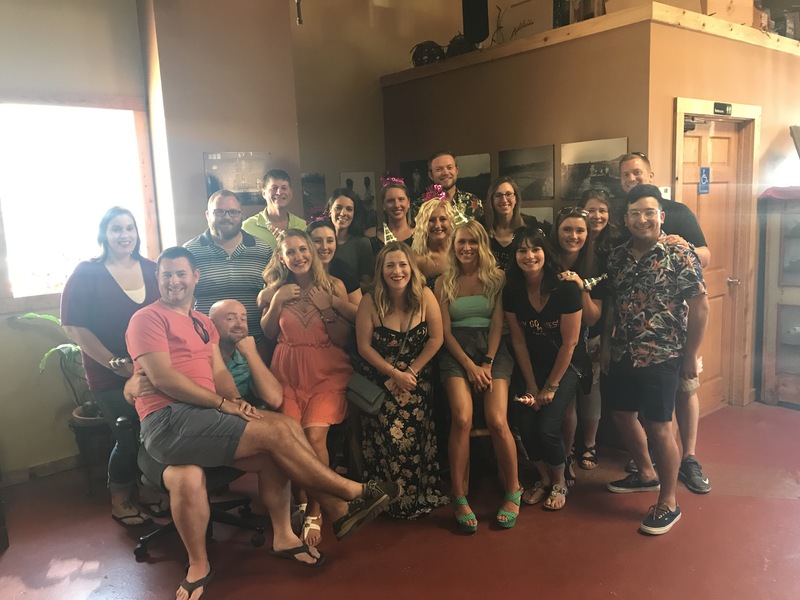 Happy 30th Ebeth! I am so grateful for our friendship 😘 love you! 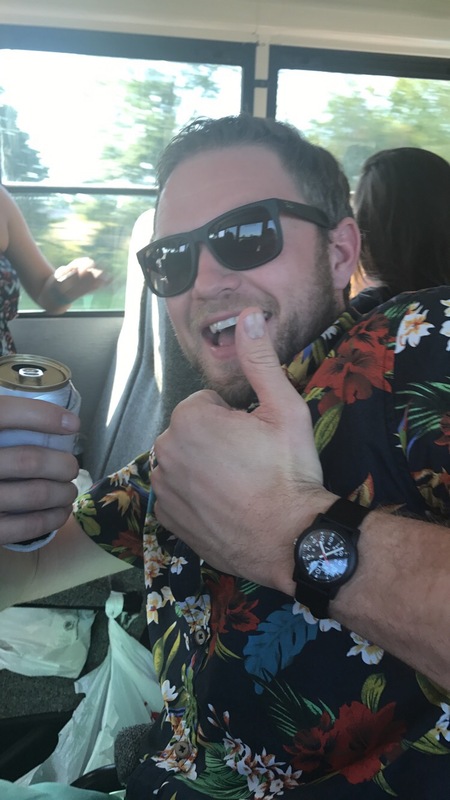 Now to get ready for the week after so much fun! Why is recouping so much harder now!?! All the muscles hurt from air mattress sleeping and exhausted, but it was worth the memories and fun! 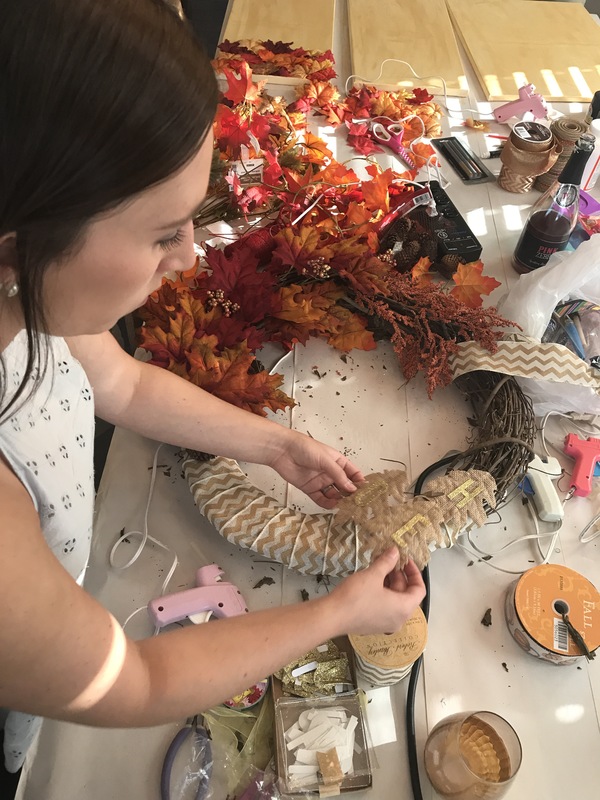 Friends, fall crafting and facials – what more could a girl ask for!?! Oh food… could ask for food, don’t worry there was plenty of that too! 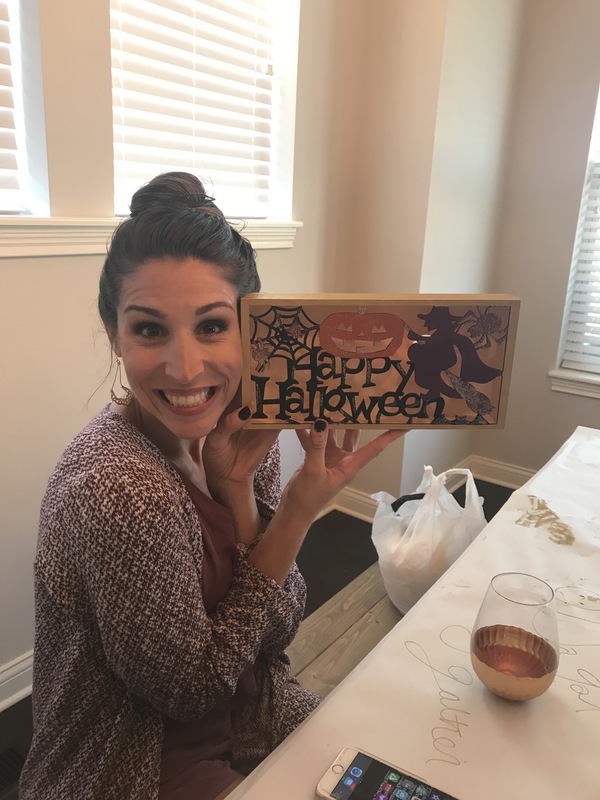 My wonderful friend Elizabeth so graciously hosted Jenny and I for a fun night of fall crafting, facials, music videos, wine and yummy noms. We each brought supplies for our crafts. 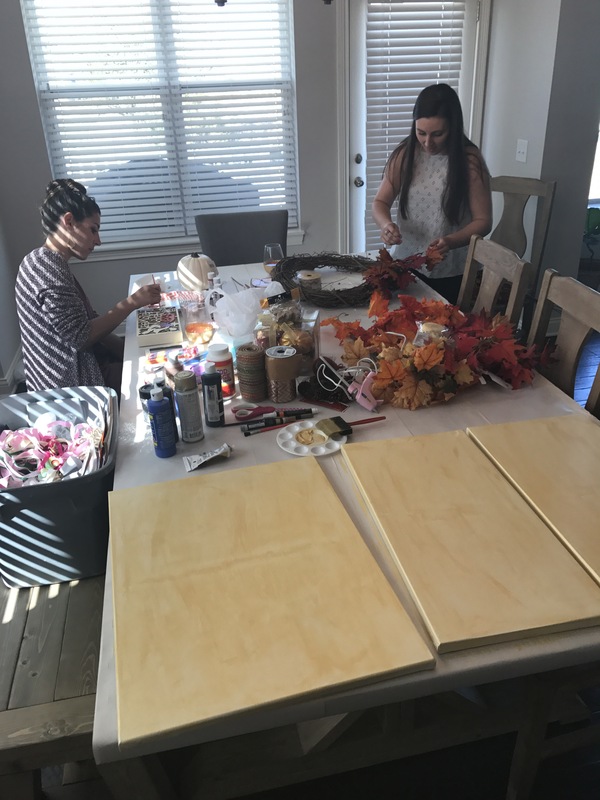 I made the above canvases with the help of Jenny for penmanship , Ebeth made fall wreaths and Jenny painted a cute Halloween piece that lights up! 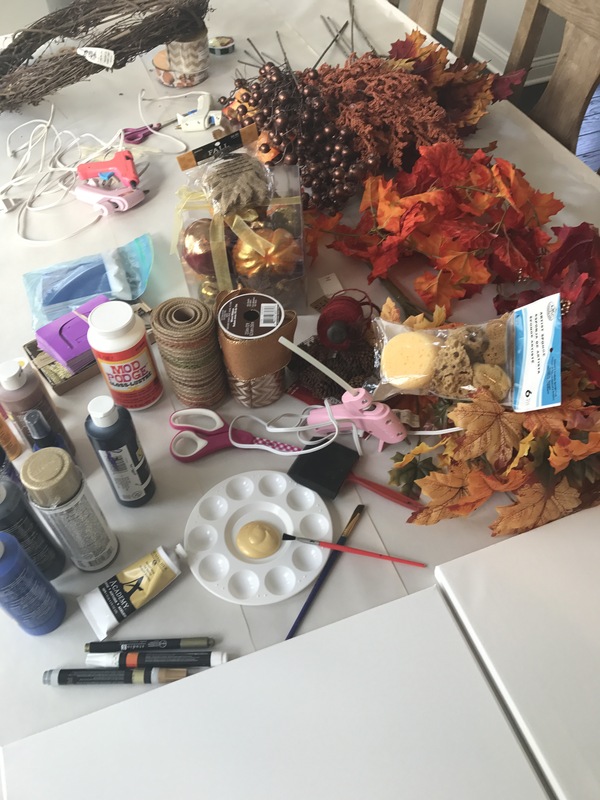 The table full of supplies shown below. 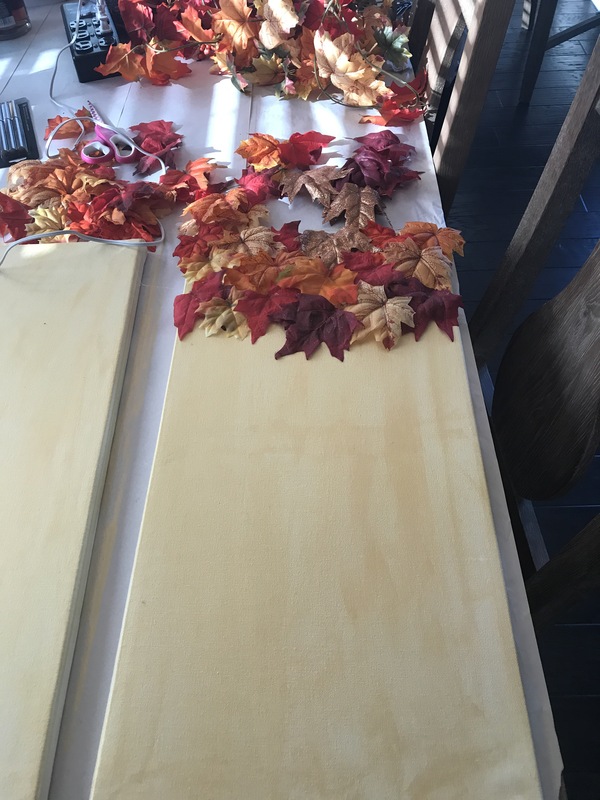 For the canvas project start with 3 blank canvases and select a base paint color. I used gold acrylic paint and used a sponge brush to paint with. 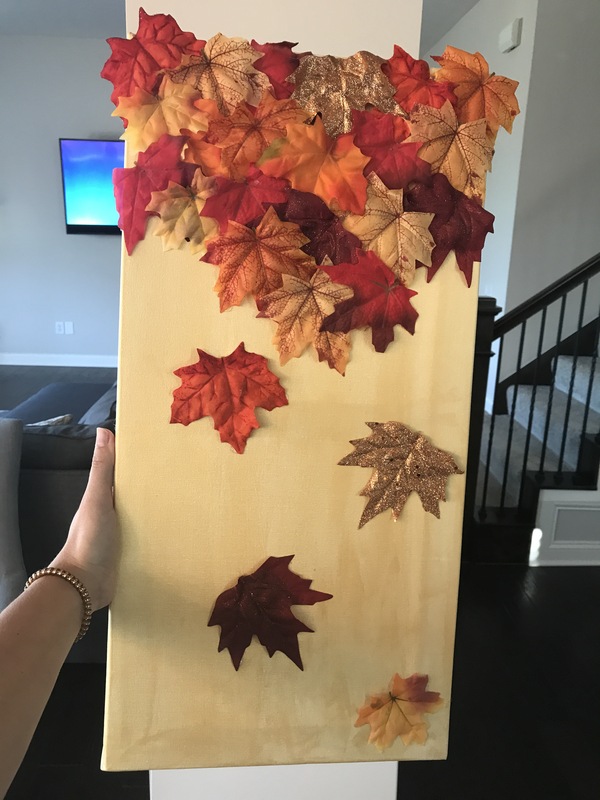 Then on the more narrow canvases I took leaves that I cut off of the string of leaves from floral section at Michaels (awesome deal of 50% off floral section) and used a glue gun to hot glue the leaves in a stacked and angled pattern. 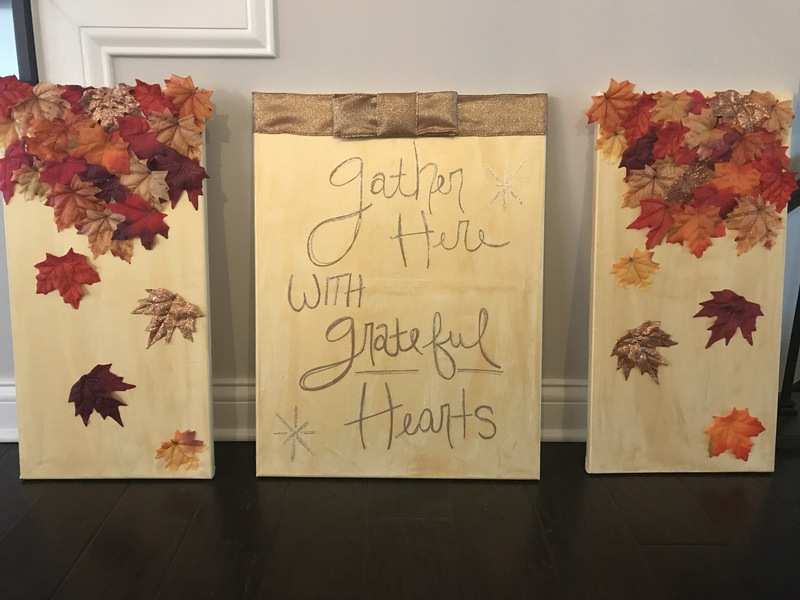 For the center canvas I love the saying Gather Here with Grateful Hearts so Jenny first sketched it with a pencil. Then used a metallic gold marker to trace over and final touch was gold glitter paint on top. I then hot glued a ribbon across the top and Jenny made the bow to glue on top. 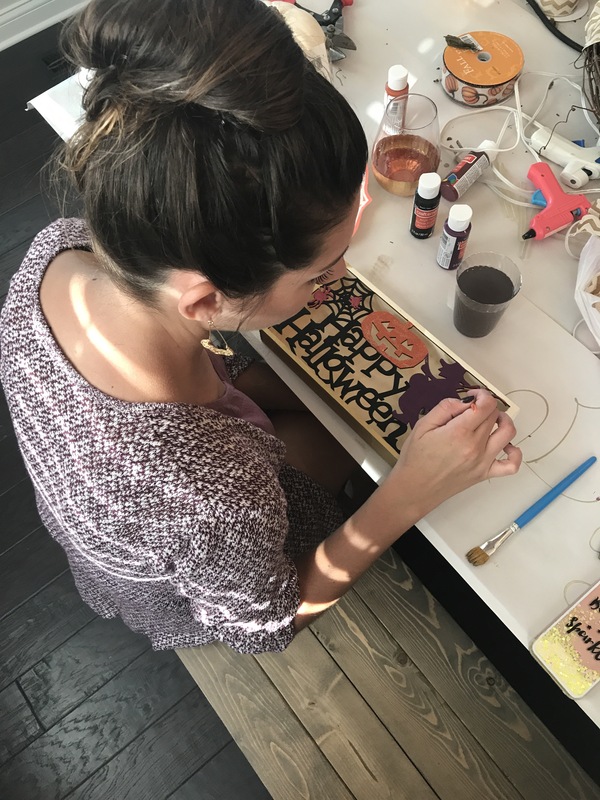 For Jenny’s project she purchased a wood sign that lights up to be painted and she did an awesome job bringing the sign to life! 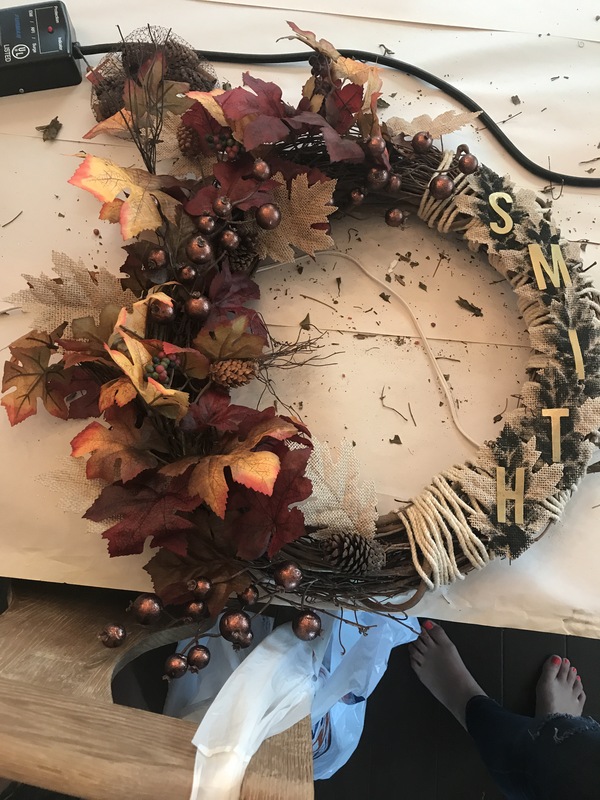 Ebeth made 2 beautiful wreaths with fall floral pieces and ribbons then personalized each with letter cut outs. We then moved onto facials. 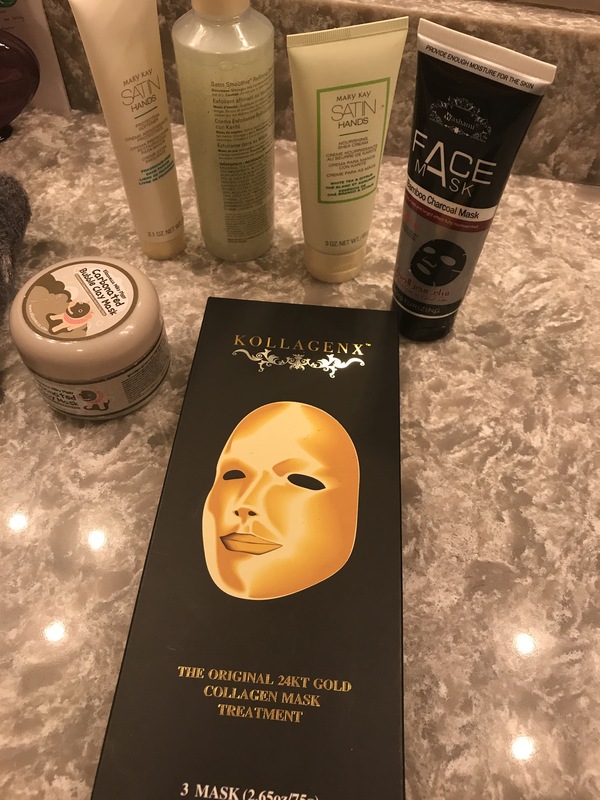 We tried a charcoal face mask as well as 24 kt gold face mask. I must say with the charcoal I’m glad I had some wine to numb me a little because ouch! Sorry girls I know we all look so beautiful, but only fair to show what these mask look like! 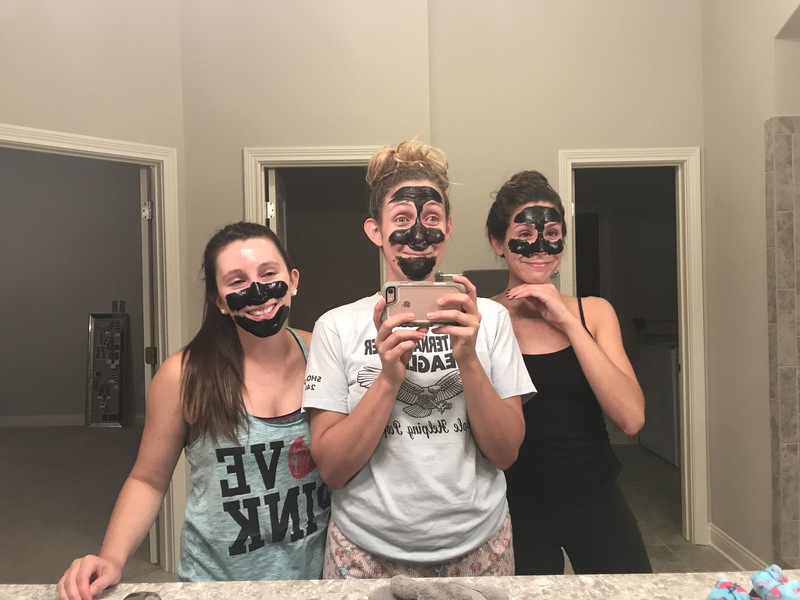 The charcoal mask hurt pulling off for the fact of all impurities and any hair (watch your hair-line – ouch!) comes up with the mask when you peel it off. 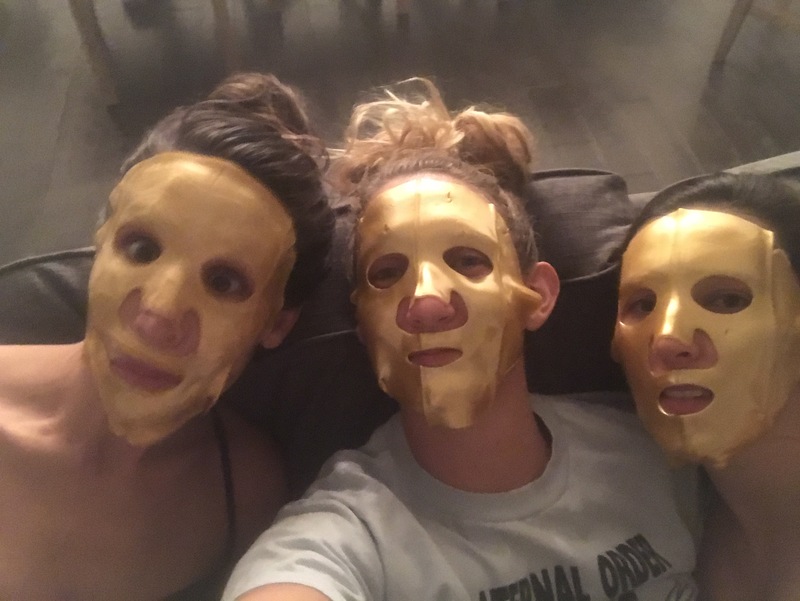 Luckily the 24kt mask provided a cooling sensation after feeling like we ripped off parts of our face, but hey beauty is pain at times right!?! The bad thing about the gold mask is you can’t really move as they slide real easy. The fact you can’t really talk that much is clearly a struggle for myself and my beautiful friends. How can you look like this and not laugh when ya look at one another!?! I love these girls and always have so much fun no matter the activity! Make time to treat yourself and have fun with your friends, it is good for the soul! Cooler weather and stress bring on my desires for all the carbs that are tied to my favorite comfort foods. I’m sure am not alone in these feelings right?! Today my parents were unexpectedly in Indy due to my cousin unfortunately having open heart surgery. During scary and stressful times I tend to want to help provide comfort with food in addition to silent prayers. I know not everyone handles stress the same way nor will everyone want food, but my family always loves food! I knew my dad was really worried about his nephew. My dad is the baby of a large family and his nephew is not that much younger. Since there is not a large age gap they grew up together more like brothers and are still close today. Since the hospital is nearby my parents came over for dinner. I knew my dad needed some comfort, so I made his favorite comfort meal, which is basically all carbs! 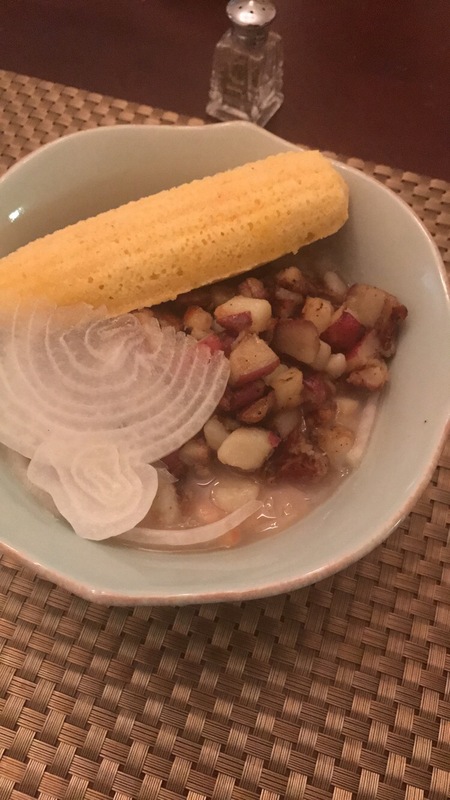 The image above is my dad’s favorite which is ham and white bean soup, fried potatoes and corn bread topped with an onion slice. I of course used my cast iron skillet for the potatoes and cast iron corn bread pan in the shape of corn cobs. Recipe- Randall Beans and fill the jar 1/3 of the way with water and add along with small package of ham chunks with salt and pepper to taste on medium heat until boiling. 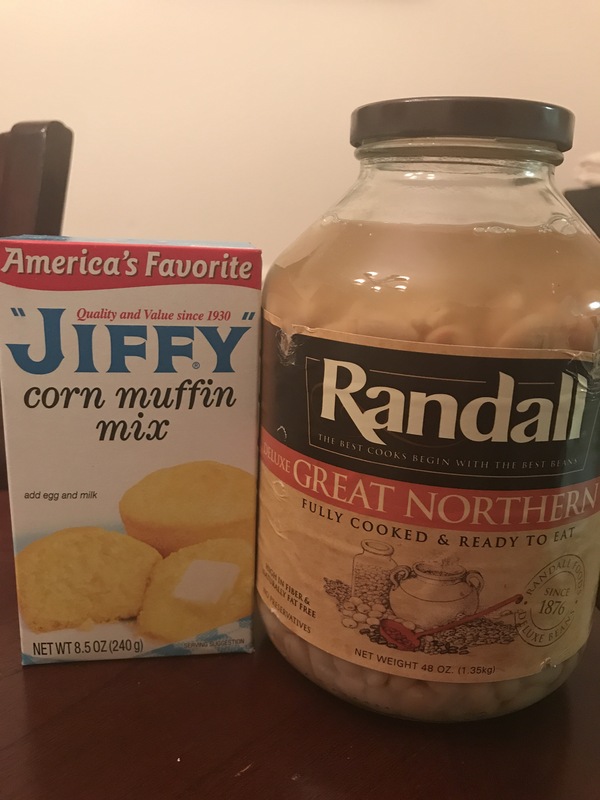 Cornbread- I use Jiffy and follow the recipe with the exception of adding a teaspoon of sugar. Fried potatoes- Red potatoes were on sale at Fresh Thyme today for .77 per pound. I left the jackets on and diced them while 2-3 tablespoons canola oil heated in my iron skillet. Cook on medium heat until tender and I like to have them get a little crunching by cooking a little longer. Funny how different foods bring comfort and a sense of nostalgia. I would say my speciality niche is comfort food as I like to provide that experience to those I share a meal with. What is your favorite comfort food? Mine is meatloaf! *Thankfully the surgery went well and praying for a speedy recovery.